Sometimes your customer database can end up with duplicate customers despite Timely's best efforts to prevent this. Fortunately Timely makes it easy to identify and then merge these duplicate customer records. 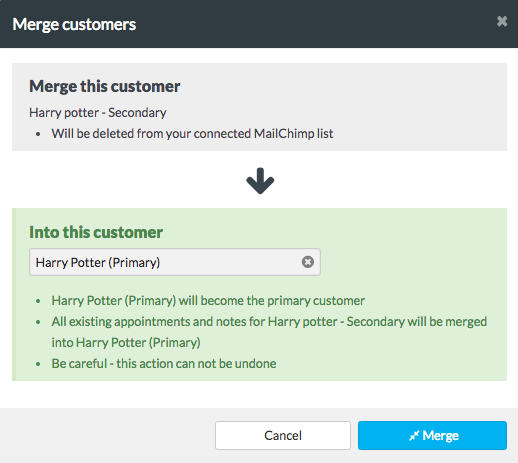 Merging customers allows you to combine the appointment history of two customers into the one record. Run the Duplicate customers report. Note: To open the customer's record in a new tab, right click on the customer link. When you are merging customers, there will be one Primary customer and one Secondary customer. The Primary customer will be the record that will be kept and the contact details of the Primary customer will be used for the merged customer record. The appointments, sales and notes for the Secondary customer will be transferred to the Primary customer, then the Secondary customer's record is deleted. This will delete the original customer and move any missing details and appointments to the primary (or second customer).